The C-130 is the world’s most prolific cargo hauler and it’s been adapted to do pretty much everything imaginable with one exception: operating on water. Yet some of the folks at Lockheed wanted to do just that in the 1960s. Sure, amphibious planes are a niche, but the already boat-like C-130 seems like a perfect candidate. Making the C-130 into something capable of playing in water involves more than just modifying an amphibian hull onto the plane’s already rotund fuselage. And it would certainly look amazing (I am a sucker for float planes, especially huge ones), but the drag and weight penalties caused by mounting floats on a Hercules would be damning, greatly impact range and detract from the C-130’s useful load. Was This Huge WWII Floatplane Going To Deploy Mini-Subs To U.S. Shores? Instead, a C-130 flying boat would experience a minimal drag penalty induced by its stepped hull and outrigger floats. In fact, those outrigger floats could potentially be attached to the C-130’s existing outboard wing hard-points and loaded with fuel. One could even imagine small boats being designed to be raised and lowered via modified inboard wing pylons. This would allow a C-130 amphibian to retain its cavernous cargo hold while having small boats available to act much like a traditional patrol ship. The best part about the amphibian flying boat concept is that it doesn’t have to live and operate on water alone, but it can just as easily operate from land and conventional runways. Although the romantic idea of taking a flying boat to some far-flung exotic locale died many decades ago, the flying boat idea has been coming up lately, but with a futuristic face-lift. Although many of these modern, fantastical flying boat concepts are laughable, a C-130 amphibian has clear practical uses, without needing any expensive infrastructure improvements. A C-130 amphibian would probably be the best fire-fighting aircraft of all time, being able to scoop up thousands of gallons of water on lakes and waterways while still being able to operate from existing land bases for retardant drops. Above all else, such a configuration would also allow these aircraft to utilize the common parts bin and logistical train as normal C-130s. This would lower operating costs and increase availability, both factors that has heavily hampered a hodgepodge of other flying boat fire-bomber concepts over the years. 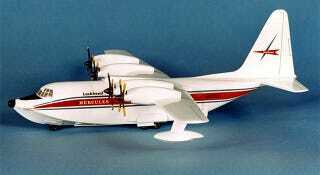 Even the U.S. Coast Guard could benefit from such a C-130 configuration. When used in the search and rescue mission, USCG Hercules can locate survivors and even toss down supplies to them in some circumstances, but they can’t rescue anyone. An amphibian configured C-130 could prosecute the entire search and rescue mission under decent weather and sea conditions. This was a proven practice in WWII and continued into the early 1980s with the HU-16 Albatross flying boat. A C-130 Amphibian could extend the USCG’s rescue reach thousands of miles from shore. There are many other applications for an amphibious C-130, like disaster relief and even military missions, and especially those carried out by the special operations community. In fact, the vast majority of the C-130’s many missions it has assumed over the better part of a century could be carried over in a amphibian boat form. Especially “roll on and roll off” and bolt-on modifications that have become so popular over the last two decades. In the end, do we need the C-130 amphibiant? Perhaps not, but it sure would be awesome to have.